The Library Guts Frisbee team, 1974 (previously thought to be 1979). Flashback Friday pays tribute to Guts Frisbee, which had its first invitational tournament in Eagle Harbor, Michigan in 1958. 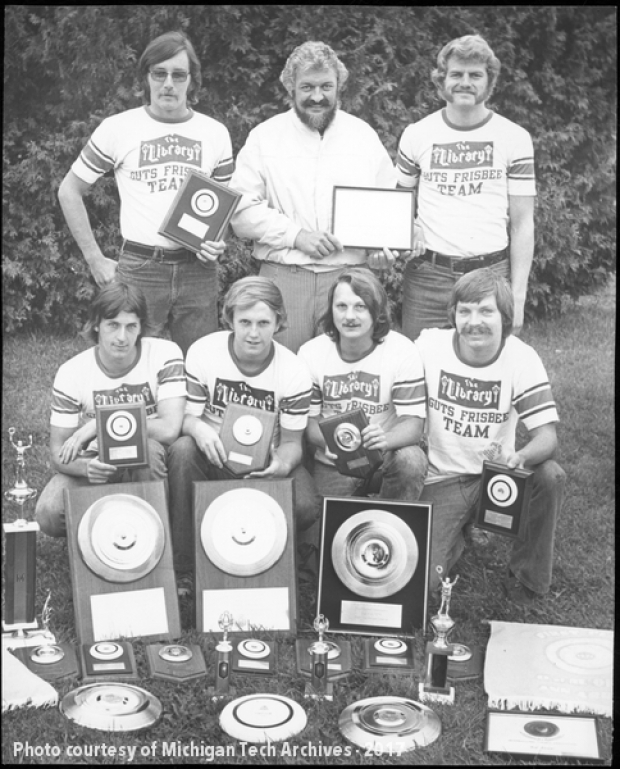 Our image takes us back to this day in 1974, when the Library Bar Frisbee Team had a grand year in Guts Frisbee. The team took home the world championship as well as all major tournament wins. The team can be shown showing off all their hardware in this triumphant photograph. Standing from left, are Bill Dwyer, Jon Davis (team sponsor), and Bill Hodges; in front, from left, are Bob Hansen, John Hodges, Joe Wickstrom (captain), and Bob Reade. While this photo is from 1974, the game of Guts Frisbee has an origin story that dates back to the 1950s. In 1958, brothers Boots and John Healy discovered a “Pluto Platter” in a shop in Minneapolis. The disc was passed around the family until Tim and Mary Healy, along with some friends, began tossing the frisbee around on July 4, 1958. By the end of the day, the game of Guts Frisbee was invented. The first tournament was held later that year at a family picnic in Eagle Harbor and the rest is history. For a full rundown of the history and modern day status of Guts, be sure to check out their website! Actually, this photo is from 1974. I played guts with and against some of these guys, notably Hall of Famers Bob Hansen, the late John Hodges, and Bill Hodges. John Hodges would have been the captain. And Bob Raade is the proper spelling. The game of guts is still going strong and the 61st IFT was held in Calumet this past year. The Hall of Fame is located in the Calumet Colosseum in the second floor ballroom. The Appleton Assassins won every tournament last year, the first team since this Library team to do so. Thank you, Dennis. I’ll make a note of the date and be sure to correct it!